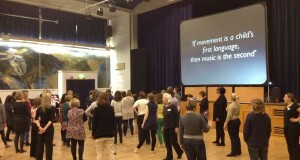 This year’s London Early Years Music Network conference is asking how important innovation is in our practice. What does innovation look like? We know it is not about reinventing the wheel but about having the confidence to reflect, reassess, question and push ourselves. In a climate when we have to shout louder about how fundamental music making is for our young children we need to be confident that our practice is the best it can be. This one day conference presents a broad programme including a keynote to challenge our thinking, case studies of new approaches, and practical sessions to reinvigorate our skills and passion. Stuart Whatmore from Tri-Borough Music Education Hub sharing the process of collaborating to create an effective early years music offer for all. Professor Adam Ockleford will launch his the new Sounds of Intent in the Early Years framework. Book your surgery (either or both!) when booking your conference ticket. You will be given your surgery time-slot at registration on the day.